I was just looking back at my post on Baked Chicken Meatballs to remember what I wanted to do differently this time, and it made me realize it’s been quite a while since the last post. Basically, like everyone on the planet, I get busy. There are too many ways I want to invest my time, and unfortunately blogging falls low on the priority list. But I don’t want to erase what’s already been published. You probably just won’t hear from me much. I started working half-time at the end of May. It was a good decision. I love my job, and I also love that there’s time leftover to play mommy and wife and housekeeper. Baby is now mobile. She army crawls everywhere, picks up every speck off the floor, and is now interested in trying to pull herself up (and has, once). In short, she requires more careful supervision. Cooking has been less adventurous lately. New recipes get tried occasionally. I’m hoping to start doing more freezing of meals as my work schedule changes and I’ll be working some full days. That will require planning! I must plan to make a plan. The hunt for a granola bar recipe has stopped, or paused, anyhow. But I have become a big fan of the granola cereal from 100 Days of Real Food. A batch lasts me about a week of breakfasts (and some snacks), and I’ve taken to making double-batches now so I don’t have to make it as often. My dream of making all my bread from scratch is also on hold. My husband didn’t seem to be eating it. And now, we just aren’t eating that much bread, anyhow. Summer has meant learning more about farmers markets. Our vegetable consumption is still not what it needs to be, but my recent interest is baked squash. I’m stocking up on local squash now while they’re in season. Found someone who sells farm eggs for a decent price, and just today found honey produced in town for a decent price, too. Newest struggle is feeding a baby. I’ve had some guilt about feeding her formula about half the time, when she could have breast milk if I just worked harder at pumping. Solids are now entering the picture, too. I froze some peas, beans, squash, sweet potatoes, and peaches, but end up giving her applesauce often because it’s easy and she loves it. She’s also entered the world of puffs. We breezed through the world of cereal, because I found it boring — and irritating. Have you ever looked how many ingredients are in the average box of baby rice cereal? Makes me uncomfortable. I’m feeling generally uncomfortable about feeding non-food chemicals to this brand-new little body (and then eat them myself). The last few weeks have been busy ones for my 7-month-old daughter. It’s hard to resist the temptation to write down her every move on Facebook! Baby started looking like she was about to creep or crawl in mid-August. My brother went off to college, and we said she’d probably be crawling when he came home for Labor Day. And it was true! Right after that she started army crawling, and she’s really getting around now. Baby supervision is thus a much bigger job now. She would never consider playing contently on the square of her play gym now. The gym is a starting block from which she decides what trouble to get into next. Trouble there is. First, the entertainment center had pretty sharp corners at the bottom that needed padding. She became attracted to every speck of anything on the floor — Mommy had to find her vacuum and broom. She fell in love with electrical cords. She made it her personal mission to get behind the entertainment center, and thus the first dining room chair fell into baby-proofing duty. Etc., etc. I was feeling her gums today and felt some sharp little bottom teeth for the first time! Today was her first visit to the local library’s infant lapsit. Also today she had her first little puffs to eat. I think of the five we took out of the container, up to a third of one may have been ingested. But it kept her interested while we had supper. She is extremely observant. Always curious, touching everything. As my mom says, “her little hamster is always going” in her head. She’s still not big enough that I can carry her on my hip, which is inconvenient. Her tiny blond hairs look like they’ve grown a little in the last month or so. She’s entering the phase where she bonks her head on something several times a day. For quite a while she’s been taking four half-hour naps a day. Lately, she’ll wake up from a short nap and seems to be in great need of another. I wish we could figure out how to do an hour-long nap! I keep her Fisher-Price rotary telephone on the bottom shelf of her changing table. If I set her down on her bedroom floor, she makes a beeline for the telephone. Likewise, she notices if a new toy is on the floor amid her normal ones. She has a memory! She has the world’s most kissable cheeks. My lovely husband hauled home our new chest freezer late last month. It makes a wonderful addition to our downstairs bathroom, which had an awkward blank spot that is exactly freezer-shaped. Having a freezer means I don’t have to worry so much about what will fit in the freezing compartment. It means I can buy fresh, local/in-season produce and save it up for when it’s no longer in-season. I’m new to freezing, mostly, and my vegetable repertoire still isn’t fantastic, so what I’ve been up to probably doesn’t hold a candle to many people’s stocks. Freezing is kind of taking a back seat to making baby food, too, though it also goes hand-in-hand at times. The freezer fruit will probably end up mostly as smoothies. Maybe it’s not saving me all that much money in the end, but it makes me feel really accomplished to have it done. I haven’t tried my hand at any canning. The only thing I think I might use is tomatoes. What do you freeze or can? I’ve been trying to spend less time on the computer of late, and more time cleaning my house — the first part of that statement has been more successful than the last. But here are some recipes we’ve had lately. All were winners. Balsamic Lemon Chicken from Everyday Mom’s Meals. YUM. I didn’t marinate this as long as called for, but it was still delicious. Said husband to baby, “Best chicken Mommy’s ever made.” Though that’s not saying much. 🙂 I am planning to make it again for company and will marinate it the full length. 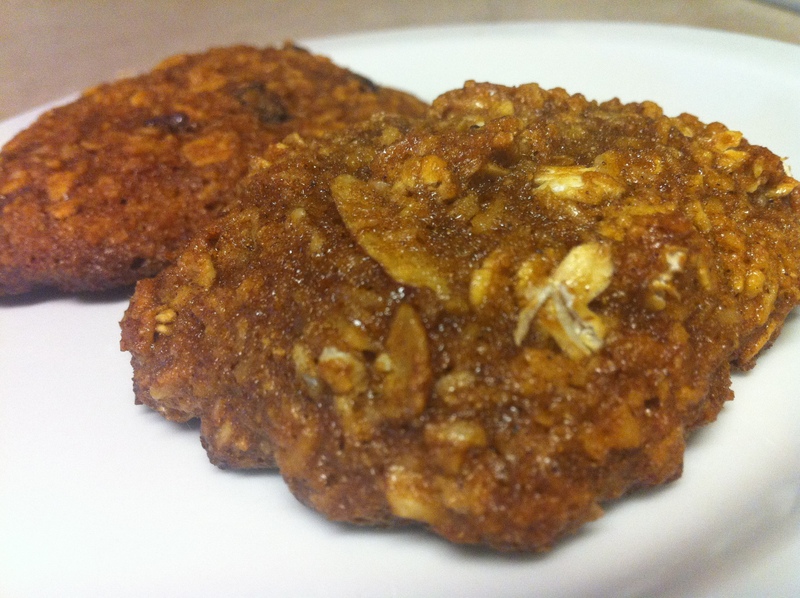 Cashew Cookie Larabars from 100 Days of Real Food. I have never had a real Larabar, and I’ve never had a medjool date, but I wanted to try it out. My husband ate his fair share of the results, so that’s a positive review. “Cookie” doesn’t seem like a good descriptor, though. Will probably make again, if for no other reason than that I have dates left over. Crunchy Peanut Butter Power Balls from Afternoon Popcorn Snack. Said husband of the Larabars above, “I’ll eat anything with peanut butter in it.” Not sure how true that really is, but it made my interest pique when this recipe came along in my inbox. 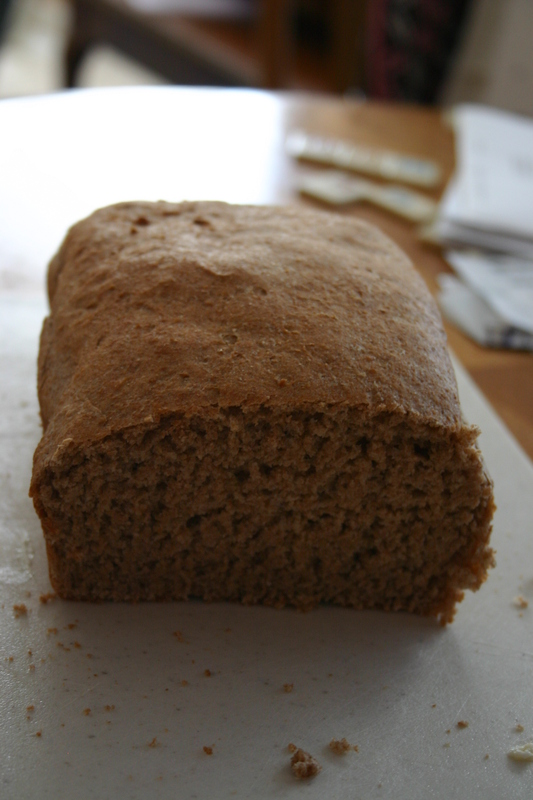 I subbed wheat/oat bran for the wheat germ and only used 1/2 cup of honey, but the results are pretty yummy. They’re filling, too, much more than they look. Layered Overnight Summer Salad from Modern Christian Woman. Pretty good. Dinners that I can make in advance always make me feel accomplished. As a main dish, the taste got a little boring by the end of a big serving, but, I’d probably try it again. Ravioli Cups from Tasty Thumb. Pretty good. They’re basically lasagna made from ravioli and baked in muffin tins. The only two things I didn’t like about it were the brand of ravioli I used — they were a little wider than my muffin tin cups, so I had to break the edges off, AND they had peppers in them — and it made a royal mess of my muffin tin. 12 little cups to clean out! But, it was something different and kinda fun. I’ve been enjoying the Artisan Bread in Five Minutes a Day, but I’ve also been wanting a light, plain, whole-wheat sandwich-style bread. So I tried this recipe at Deliciously Organic. Easy to make — very little kneading, quick. Thanks to the bread recipe at 100 Days of Real Food for the recommendation. I don’t have a bread machine, and don’t want to use a stand mixer, so hers wasn’t for me. My only comments about the recipe I used: Mine could have used more salt, but I’ll reserve judgement as I eyeballed the measurement on that one. (By the way, my ingredients were mostly non-organic.) Also, my rise prior to baking took a little more than the 30 minutes. I halved the recipe and baked it in a loaf pan for a little more than the 20 minutes called for. The result was a little more fragile than I’d like. Maybe that’s the nature of homemade bread as opposed to store-bought. Isn’t frumpy a colorful word? Love it. I do not, however, love being frumpy. Which I largely am — largeness being the majority of the problem. This isn’t a post-baby frump. It’s definitely been at least post-high school, but most likely life-long. (Can juveniles be frumpy?) When I think back to my first days of college, I picture myself in this awful plaid tank top and think wow, what a square. Little makeup, if any. Hair unkempt. Generally unpolished. And the same is true today. Truer, even. My complexion’s generally clearer, so I don’t even bother with cover-up. Don’t own any foundation. Mascara’s definitely outlived the recommended shelf-life. Hair an undefined color between used-to-be-blonde and not-brown. “Unpolished” comes back to mind, overall. And overall, I don’t have a problem with this. I’m me. I’m reasonably comfortable in my skin. Primping feels like a waste of time, in that its effects generally wear off quickly. And I just don’t enjoy doing it. I’d rather be doing something else. But there are times when it gets to me. Earlier this week I was at a professional conference. My attire was neat but not dress-to-impress. My makeup was non-existent — again, didn’t feel a need to impress these strangers. My hair was not in a great state, having had to rush out the door with it still damp. A woman from a national group was keynote speaker at the conference, and she expressed interest in speaking with those of us working at the grassroots, local level. She seemed genuine about that. But when I tried to engage her in a brief conversation later in the day, it was a no-go. Quite possibly she was a) busy or b) not getting the probably-too-subtle signals that I wanted to converse. My appearance, though, probably did nothing to help my cause. This … woman? girl? person can’t have much of value to lend this conversation. She can’t keep herself together — how can she contribute professionally? It’s hard to take her seriously. I’m not sure how to conclude this post — only that I’m aware of my frumpiness (frumpyness?) but not obsessed with it. Not really even worried about it. Just aware. And hoping it might disappear without me having to put any effort toward it.